This group began with a single person (UW graduate) that desired to create a group that explored the Korean culture deeper and beyond just “K-pop” and amazing Korean food. 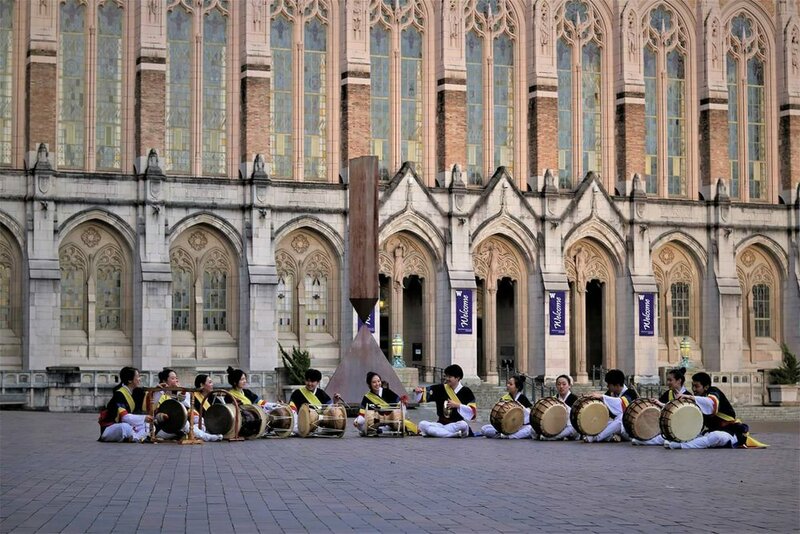 As a former student of the Korean traditional percussion music, he wanted to create a club where people can practice, explore, and connect through deeper roots of Korean music. Through fate and careful searching, the founder was able to meet with our director/instructor (who is an amazing professional in the Korean arts) and began to create our club, Hanwoollim, within University of Washington. One person became four people, four people became many people. It grew and became one of the uprising performer groups within UW. Our club isn’t just exclusive to Korean people; we welcome and encourage all people who have interest in Korean culture to play! Our performance is based on several elements, from how we execute each beat and transition from one rhythm to another to channeling our energetic spirit and movements. Just like how the piano has different dynamics such as fortissimo and pianissimo, we use these different dynamics and rhythms to create a unique composition of four main instruments. When we practice and perform, we channel our pride and spirit with our powerful beats and elegant movements, hoping to resonate within our audience. Our performance is part of a great legacy, which pays homage to the people who used music to reinvigorate through hardships. To us, traditional music is our connection and a small glimpse of Korean history. Since we are a community where diversity and various cultures are welcomed, it’s exciting for us that we have a platform to showcase as well. We are a little nervous, super excited, and seriously determined. We are proud to be part of a festival that promotes diversity. We feel that the audience should prepare themselves to be “WOW-ed” by this year’s amazing plans for the festival, and we hope that we can show the audience that K-pop isn’t the only good music Koreans made.